Ashlyn Morgan enjoys spending time in nature and making a big bowl of flavors in her Tennessee kitchen. 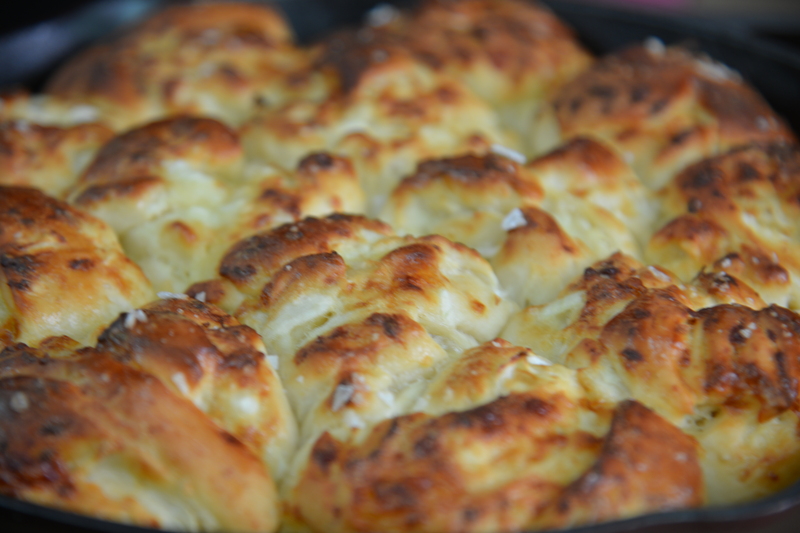 She takes inspiration from her southern kitchen and makes a Southern Cheese and Onion Roll recipe with a really strong cheese during the "Bread Week" signature bake. She bakes and presents her cheesy dinner rolls southern style in a cast iron skillet which the judges, Mary Berry and Johnny Iuzzini love. Host Nia Vardalos loves the idea of cooking in a skillet as it makes for easy clean up. Watch the full "Bread Week" episode from Season 2 Episode 3 of The Great American Baking Show. 1. Preheat oven to 375F/190C. 2. Scald milk in a saucepan. Add beef tallow to melt. Let it reach between 110-120 degrees Fahrenheit. 3. In the bowl of a stand mixer, mix together milk, water, beef tallow, sugar, salt, and yeast. Whisk together and let set for 5 minutes. 4. Using a dough hook, add flour in stages until the dough comes together. Once dough comes together, knead on medium speed for 8 minutes. 5.Chop onion fine with a food processor. Grate cheese in food processor with grate attachment. 6. Roll out dough. Sprinkle the onion and cheese on the dough and knead to incorporate. 7. Cut dough into 12 equals pieces and form into balls. Use scale to divide dough equally. Place in a cast iron skillet. 8. Let dough rise 1 hour or until doubled in size. 9.Brush tops of rolls with egg wash and sprinkle with Maldon salt. 10. Bake rolls for 15 to 20 minutes until golden brown. 1. In a stand mixer, whisk the butter until light and fluffy. 2. Mix in the honey. Set aside. 3. Soak mold in ice water for 30 minutes. 4. Rinse mold under cold water. Fill with honey butter. 5. Cover with cling film. Place in freezer for 1 hour. 6. To unmold, run knife around the edge and gently pop out of mold. 7. Serve butter with parsley and thyme garnish.